Today Heart related problems have become very common across the world and large numbers of people are suffering from such diseases like High BP, Heart Disease, Blockage of arteries etc. One of the main cause of most of heart problems is a high level of bad cholesterol and triglycerides in blood. If, no measures are taken on time then high levels of these things can result in severe heart diseases. One of age old, natural ingredient garlic is believed to be very beneficial in the control of high cholesterol levels in blood. There are many studies which clearly state that chances of heart problems remain much less in people who consume garlic or garlic products as compared to people who do not consume garlic or garlic based products. Garlic intake is found to be effective in decreasing blood pressure, bad cholesterol and triglycerides levels in blood. To make it easy for people to consume garlic, Ranbaxy has come up with Garlic Perals. The main active ingredient in garlic pearls is Garlic Oil concentrate 0.25% w/w in each capsule. 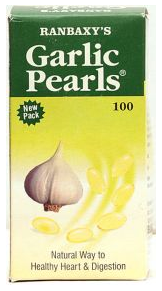 Garlic Pearls are available in the form of soft gelatin capsules. One of another benefit of Garlic is correcting digestion related problems. Therefore, this capsule also works very effectively in treating many gastro-intestine related problems. Ranbaxy claims that they have made it very simple and easy for people to consume Garlic in an effective and simple way. I have been using these capsules from last three months. I have found them quite effective in treating GI and high cholesterol related problems. Though, I will strongly say that these pearls cannot be taken alone as treatment for any of such problems, you can just use these pearls for some positive effect with other medications. In a published study, Garlic Pearls are found to have a good effect in lowering triglyceride levels, though this study failed to signify their effectiveness in controlling high Serum Cholesterol levels. As per my experience, I felt some relief from high BP and stomach upset; however, there was not much decrease in high cholesterol and triglyceride levels by using this product alone. Recommended dosage of Garlic Pearls by Ranbaxy is two capsules thrice a day, though you can start with a single capsule daily and increase its dose later as per the requirement. You should consult your doctor before starting garlic pearls if you are suffering heart related problems.